The right agency for you. We're proud of our past and we're excited about our future. We want you to be part of it! We have a long history of proudly serving West Michigan as an Independent Insurance Agency. We've been advising clients and representing some of the best insurance companies in the Midwest (and in the entire country) for over 100 years. We have always been, and always will be, family owned and operated. We know family is the foundation of West Michigan and we think family business is the best way to serve our community. Bruce Boer (1st generation) was the first Boer to enter the insurance industry. He joined the business after graduating from Michigan State College in 1950. Bruce bought the business from Ivan Hull, his step-father, in 1954. The business name was Field-Boer Agency at that time. In 1956, after serving in the U.S. Army, Ronald Boer (Bruce's brother) joined Bruce. Bruce and Ron continued to operate under the Field-Boer Agency name until 1964. At that time Jack Siebold, a partner in the Utley-Moritz Company, suggested a merger. The two businesses were joined in June of 1964 and the merged Agency operated as Utley-Moritz Co.
After one of the Utley-Moritz partners withdrew from the business several years later, George Moritz, Bruce Boer, and Ron Boer continued under a new name, The Moritz-Boer Company. George Moritz retired in 1971 and died in 1976. Bruce's son, Dave Boer (2nd generation), joined the business upon graduating from Michigan State University in 1981. 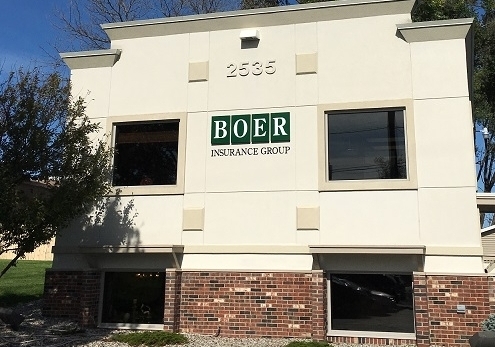 On January 1, 1998 Dave Boer purchased the business from Bruce and Ron Boer and continued to operate under the name Moritz-Boer Insurance Agency until 2005, at which time we adopted the name "Boer Insurance Group." Dave's twin sons, Brian and Derek Boer (3rd generation), joined the business in 2015, each after graduating from Michigan State University with Bachelor's and Master's degrees in accounting and spending five years as Certified Public Accountants. Dave, Brian, and Derek Boer currently manage the business together. Their cumulative client service experience and business knowledge, both inside and outside the insurance industry, provide valuable perspective for our clients. We're proud of where we've come and we're excited about where we're headed. We hope you will help shape our next 100 years!